Young people here are anxious about achieving a First World standard of living amid rising costs and more intense competition for jobs and at work. These worries contribute to regrets among some in being born too late to enjoy the leap in standards of living of their parents' time, they said in response to Prime Minister Lee Hsien Loong's assurance on the matter. 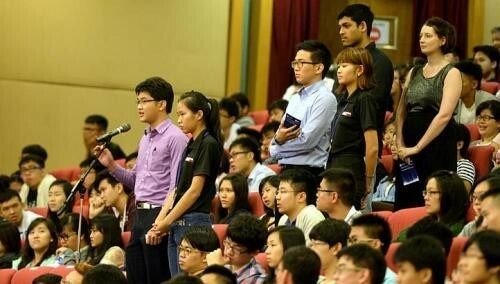 In a dialogue with over 1,200 undergraduates at Nanyang Technological University (NTU) on Tuesday evening, Mr Lee said young Singaporeans need not worry about having a tougher time than their parents because they were born too late. With globalisation and advances in technology, he said he expects the next 50 years to be an exciting if uncertain time. Yesterday, nine out of the 15 young people The Straits Times interviewed said they worried they would not be able to afford what one called "basic goods", namely a flat and a car. Finance professional Chong Lingying, 24, said: "Things within reach for my parents' generation are completely unimaginable for me. I might be earning a lot more than my father did at my age, but I can't afford a car like he did, let alone a home any time soon." Some undergraduates are more worried about jobs. Ms Joyce Lee, 23, a final-year geography student at the National University of Singapore (NUS), wonders about her prospects in the sales and journalism industries. "There is a wider spectrum and a greater number of things for my generation to achieve in," she said. "But everyone here also has more knowledge and skills. Life is going to get more competitive." Still, most of the 15 interviewed recognised that life here is good, and the rest is up to them. "It is about how hard you work given your opportunities," said Ms Khor Si Hui, 23, who graduates from Oklahoma City University this year. "I know an HDB flat is expensive, but rather than worry about that non-stop, I will save what I can each step of the way. At least, there is still the possibility of owning one." Yet others, like educational therapist Hakimah Manaf, 24, feel there are many opportunities. "I want to start my own business, and there are many support systems... today for small and medium-sized enterprises that were not available before," she said. Some also said the country has come a long way in terms of developing a more engaged civil society and greater freedom of speech. "We are more willing to speak our mind - that is something that has changed from our parents' generation, where they felt they shouldn't rock the boat," said University of Sydney student Christopher Kwong, 25. "We don't have full freedom of speech yet, but at least there are ways to give your opinions through social media, which can result in some form of change by the Government." But for the country to continue to succeed, two interviewees said Singapore must address growing xenophobia, fuelled in part by a large influx of foreigners. PM Lee also warned against this, and spoke out against abusive mob behaviour online, as seen in the recent Anton Casey case. Accountant Adillia Ayoub, 24, said: "Xenophobia is really one thing the Government needs to control and look into. Social media has changed so drastically, and not necessarily in a good way. Though the issue is not a major concern now, it has the potential to become a critical one in the near future." Still, young Singaporeans said they want to build their nests here. Singapore Management University business student Jocelyn Chua, 23, aspires to a career in the luxury fashion industry, and it makes more sense for her to seek jobs in New York, London or Paris. "But that would be a hard decision because at the end of the day, this is still home," she said.